A female student stands by The Rock on Monday, displaying a cardboard box with a statement saying that she was raped. The student left campus on Tuesday. 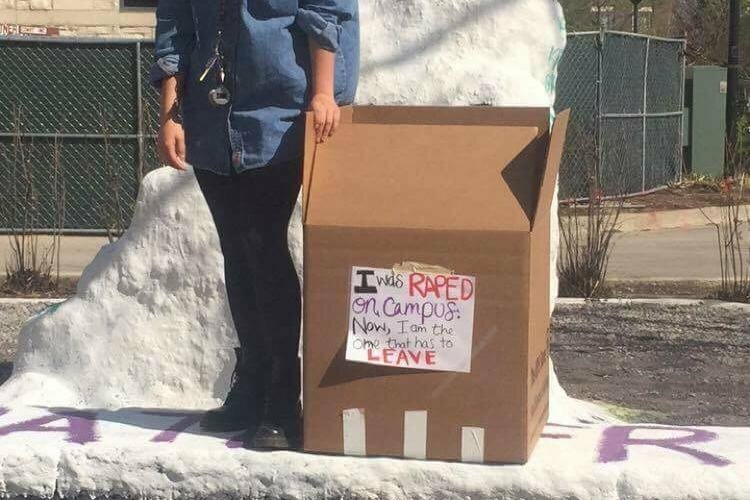 A female student sat in a box that read “I was raped on campus. Now, I am the one that has to leave” at The Rock and around campus Monday. The next afternoon, the student took a flight home. The student, who did not want to be named for privacy reasons, declined to comment. The student’s friend, a SESP freshman who also requested anonymity to protect her friend’s identity, said the statement on the box originated after people kept asking what was going on after seeing the female student carrying boxes to and from UPS while packing to leave. When cases of sexual assault are reported, the Title IX Coordinator, Investigator or another designee interviews parties and witnesses, reviewing any relevant evidence or documents, according to Northwestern’s Policy on Sexual Misconduct. Afterward, the investigator reports their findings to the involved parties and makes recommendations to the University. The female student chose to go on leave after feeling dissatisfied with the University’s handling of the case, her friend said. Cubbage added that NU cannot publicly discuss details of the matter due to federal privacy laws.